2/4: The Shavemac is Withdrawn due to lack of interest. I used this Shavemac this morning (Monday). It's a fine brush. So much so, that if a buyer hasn't stepped forward by the end of Friday, I'll withdraw it from sale. Santa brought me two new brushes. Gotta make room in my cabinet. On top of that, SBAD has me wanting yet another brush. Need to raise some funds. So, here are two fine specimens that need to relocate. All measurements made with my trusty digital calipers. Prices are shipped CONUS. International shipping at actual cost. The Rooney has been sold. Shavemac has been withdrawn. Shavemac 177 in Finest. 22 mm with 52 mm loft. I purchased this at the beginning of December from West Coast Shaving. 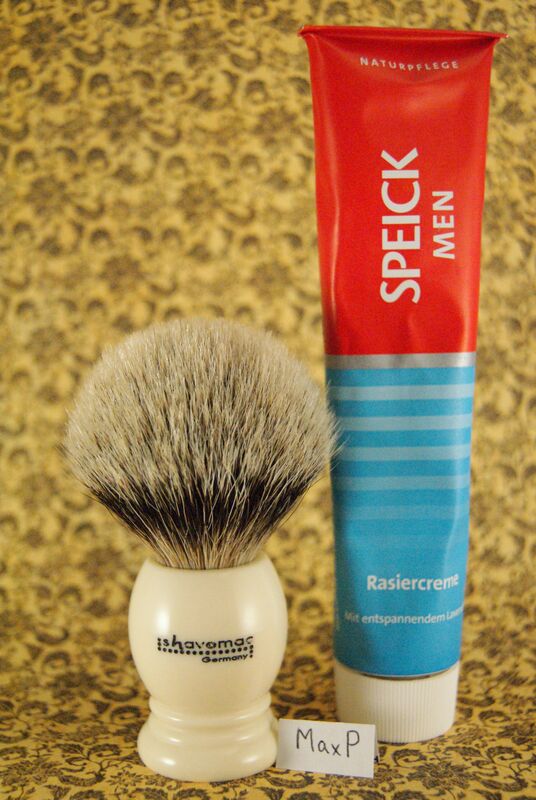 A tube of Speick cream, German origin, complements this near-new German brush. $was 75, now $65. for both the brush. Sorry the cream is not included. It got traded. SOLD A Rooney 1XL. The oft stated "gel-like tips" applies to this fine brush. 26 mm. 46 mm loft. 86 mm overall height. Three sample size pucks of Kells' Original Shaving soap included. $135. Please PM with any question. Last edited by MaxP on Sat Feb 04, 2012 9:37 pm, edited 3 times in total. Price on the Shavemac has been decreased. Last edited by MaxP on Sat Jan 07, 2012 7:15 pm, edited 1 time in total. MaxP wrote: Price on the Shavemac has been deceased. Uh... I hate when the spell checker doesn't know what I mean. Would that qualify as killer pricing? how does Speick cream compare to Wars cream from Poland? I think they're both excellent, and priced very reasonably. I wish I had some Wars again. I'm stocked up on the Speick, and that makes me feel good. brothers wrote: I think they're both excellent, and priced very reasonably. I wish I had some Wars again. I'm stocked up on the Speick, and that makes me feel good. with a Price Drop. Last one. If no one likes this brush at $65, I'll just "back shelf" it. That's a pretty nice brush to fall back on...I can't believe this hasn't been snapped up. Bump for Max, someone buy that Shavemac. Unfortunately that money went to replace a broken coffee filled MacBook. I was just messin' with you. Sorry to hear about your Mac. Ach. BUMP with Final Week message.